1:53 PM: A Daly City man accused of lighting a fire at the Chinese consulate in San Francisco on New Year’s Day allegedly told FBI agents in an interview after his arrest that he had been hearing voices in Chinese, according to court documents. Details of the interview were contained in an affidavit submitted by FBI agent Michael Eldridge with a criminal complaint filed by U.S. prosecutors in federal court in San Francisco today against Yan Feng, 39, of Daly City. Feng was charged in the complaint with two counts of maliciously damaging property by means of fire and willfully damaging property belonging to or occupied by a foreign government. Special Agent in Charge David Johnson, the chief of the FBI’s San Francisco office, announced today that Feng surrendered to authorities on Friday. The fire at the consulate, located at 1450 Laguna St., occurred at about 9:30 p.m. Wednesday. The building was damaged but no one was injured. Eldridge said in the affidavit that Feng called Daly City police on Friday and “identified himself as the individual who ‘made the fire’ in front of” what Feng called the Chinese Embassy in San Francisco. Daly City police went to Feng’s address and arrested him, the agent said. The interviewers were Eldridge, two other FBI agents, and an agent from the U.S. State Department’s Diplomatic Security Service. Feng allegedly told the agents he drove to San Francisco in his minivan, a green 2002 Honda Odyssey, between 8 and 9 p.m. on Jan. 1, filled three containers with gasoline bought at a station on Geary Boulevard, and parked in front of the consulate. Eldridge said Feng told the agents he placed the containers near the front entrance of the building, poured gasoline on the front door and front steps, and attempted to light a fire with his passport, but the fire did not ignite. Feng then used a large black lighter to ignite one of the containers and saw a large fire flare up in front of the consulate, according to the affidavit. He then drove back to Daly City, Eldridge wrote. The affidavit cited surveillance videos that allegedly showed an individual parking a minivan in front of the consulate and placing objects near the front entrance. On one video, “the individual bends over the objects and, at approximately 9:32 p.m., a large fireball ignites from the individual’s location at the front entrance of the Chinese consulate,” Eldridge wrote. The two charges filed against Feng each carry a possible sentence of up to five years in prison if he is convicted. Johnson said at a San Francisco news conference on the arrest this morning that there is no indication the fire was motivated by terrorism, politics or civil rights concerns. The consulate issued a statement saying, “We have noted the efforts made by the U.S. side to investigate into the arson attack and require that the perpetrator be brought to justice. “We will follow up closely with the U.S. side on the trial. We urge the U.S. side to learn lessons from this incident, take effective measures to ensure the safety, security and dignity of Chinese diplomatic and consulate missions and staff in the U.S. and prevent the recurrence of similar incidents,” the statement said. 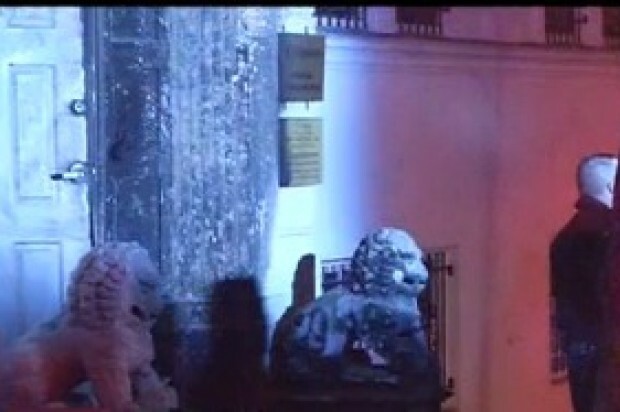 12:52 PM: A suspect has been arrested in connection with a suspected arson fire at the Chinese consulate in San Francisco on New Year’s Day, the chief of the FBI’s San Francisco office announced today. Special Agent in Charge David Johnson said the suspect, Yan Feng, 39, of Daly City, surrendered to FBI and local law enforcement officers on Friday. The fire occurred at about 9:30 p.m. Wednesday at the consulate, located at 1450 Laguna St.
Consular officials said last week that a person got out of a minivan parked in front of the consulate, poured two buckets of gasoline onto the front door and then set it on fire. The building was damaged but no one was injured, according to the FBI. Johnson said there is no indication thus far that the fire was motivated by terrorism or civil rights issues. Johnson said the suspect has been charged in federal court with two criminal counts of maliciously damaging property by fire and damaging a consulate or embassy by fire.